On June 13, 1898, the cruiser USS Vesuvius crept within one mile of the Cuban coastline and began launching explosives from her monstrous compressed-air cannons — quietly, as far as the Spanish soldiers ashore in their fort knew until the shells landed. The nighttime shore bombardment targeting Santiago was Vesuvius’ first combat mission. She still remains one of the strangest warships of the modern era. 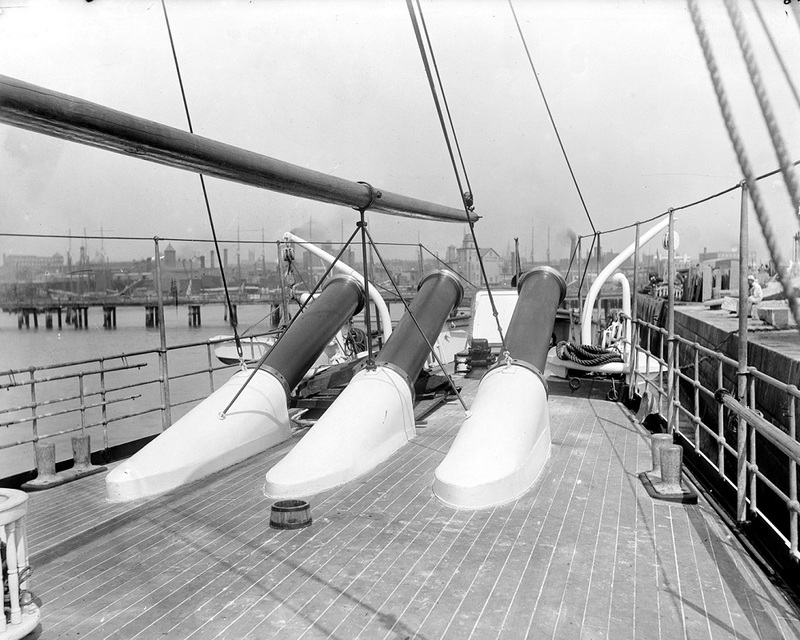 A custom-built “dynamite gun cruiser,” Vesuvius had a unique arrangement of three 15-inch pneumatic cannons capable of launching 550 or 200-pound shells with a jolt of compressed air. Fascinating from an engineering perspective, Vesuvius’ cannons penetrated into her hull at an angle — effectively making the cruiser a giant, floating triple gun. The U.S. Navy built the 246-foot-long, 945-ton Vesuvius as an experiment to solve a technical problem with artillery bursting charges, according to a U.S. Army Research and Development Command — or RDECOM — history of military explosives. Dynamite, patented by Alfred Nobel in 1867, was prone to blowing up inside their shells during launch at high velocities, restricting U.S. naval weapons development, as the Navy at the time still largely used black-powder propellants, the RDECOM history noted. European navies used smokeless powders that posed less of a danger of exceeding the pressure limit of a barrel, which could trigger a shell’s explosives. The Vesuvius’ pneumatic-powered cannons did not have to worry about excessive pressure, and the seven-foot-long, dart-shaped shells contained a relatively more stable gelatinous dynamite mixture which ignited on impact with the ground by an electric battery. 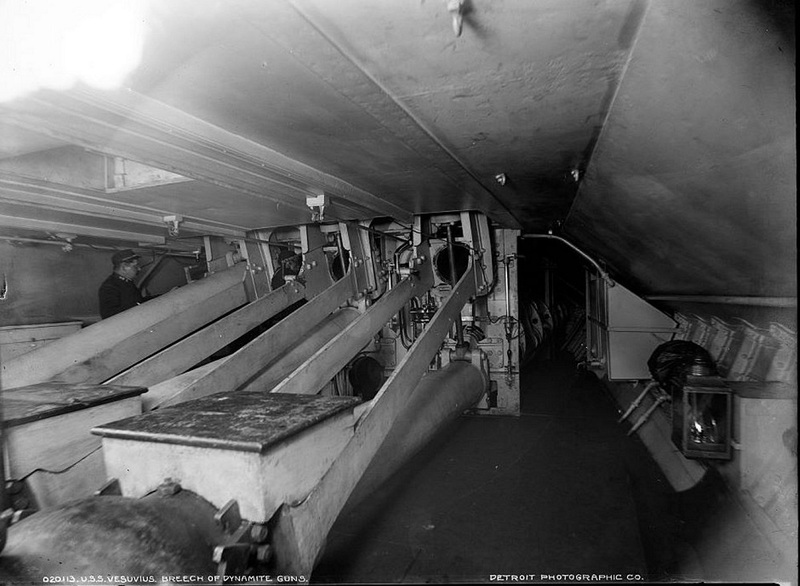 For an example of the vessel’s cannons at a fixed 16-degree angle, see these photos above and below Vesuvius’ deck. To increase or decrease the range, the crew modified the air pressure. She was also relatively small for a cruiser given the unique armament. However, her firing range was poor at a maximum of one mile with the larger, 500-pound shells — double that for the lighter shells. The attack on Santiago took place at night given that the Spanish’s forts cannons could out-range her. But the damage was reportedly significant if you believe accounts at the time. “Frightful destruction has been wrought within the Spanish forts by the explosion of the dynamite shells,” chemist Wm. App Jones wrote in an August 1898 edition of Merck’s Report. He then quoted a naval officer who thought the chances of survival in actual combat were slim — given the hull full of dynamite. Dangerous as serving on Vesuvius remained, the one upside is that her cannons were quiet at a distance. Otherwise, and during the day, she was of little use and was practically defenseless versus surface ships that could outfight and outmaneuver her with their traversing turrets and considerably heavier armor. As a result, and especially because of the cruiser’s short range, the Navy pulled her pneumatic cannons out and converted her into a vessel for testing torpedoes — but one of those torpedoes turned around and struck her during a 1915 experiment. She didn’t sink, thanks to damage control efforts by the crew, but the Navy went on to scrap her in 1922.